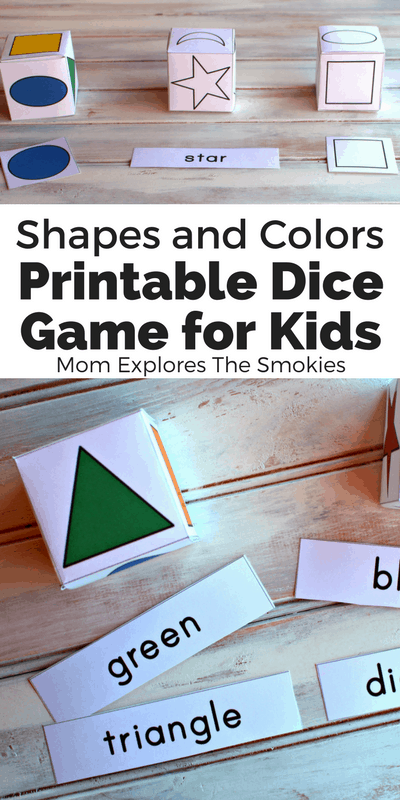 This fun and interactive shapes and colors game is part of our printable dice games for kids series. 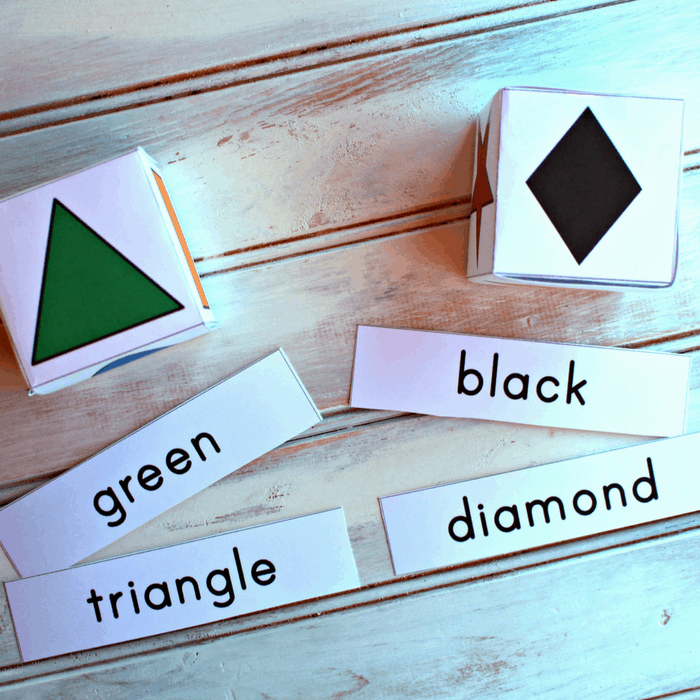 This game will keep kids engaged with rolling and matching to learn the names of shapes and colors. When they are ready, the kids can move on to matching corresponding color words and shape words. Cut out the dice around the perimeter, being careful not to cut into the fold lines. Next, fold each side the dice and all the tabs inward along the fold lines. Finally tape the tabs in place to secure the shape of the dice. Most of the tape can be placed on the inside, but the final piece of tape will have to be placed on the outside. Kids will develop color and color word identification skills by matching color to color, or color to word card. they can also hone their shape and shape word identification skills by matching shape to shape, or shape to shape word. Gross motor skills are also addressed in this activity through shaking and tossing the die. Finally, fine motor skills are addressed through manipulating the matching cards. Shape Matching – Have your child roll the die to find a shape to match. Then, use the corresponding shape cards to match identical shapes. Shape Word identification – Have your child roll the die to find a shape to match. Then, use the word cards to match the shape to it’s corresponding word. If you are using the colored shape dice, you can also have them match the corresponding color word as well. Color Matching – Have your child roll the colored die to find a color to match. Then use the corresponding color cards to match identical colors. Color Word Identification – Have your child roll the colored die to find a color to match. Then, use the word cards to match the color to it’s corresponding word. Tight muscle tone – If the student has a tight muscle tone, you can place the die in a cup with a handle (eg large plastic measuring cup). The student will then be able to hold the handle and dump the die onto the table. Crossing Midline – If student is working on crossing midline, place the matching cards on the opposite side of her dominant hand, this will require her to cross midline to reach for the cards. Depending on where the die falls after being tossed, they may also have to cross midline to retrieve the die. Sensory Approach – Using colors that match the printable, outline the shapes and colored circles with puffy paint. You can do this with the word cards as well. Alternatively, you cut to size felt pieces in corresponding colors and glue them to the fully assembled dice. You could also glue on colored sand. Kinesthetic Approach – Create your own large scale dice that can be paired with the matching color cards and word cards. Then, clear an open space and allow kids to toss the dice. The dice can be made out of a simple cube shaped cardboard box. If you’d rather not go the free route, you can also purchase this shapes dice game printable from our store for .99 cents. Which ever option you choose, we thank you for supporting our small business!